The answer to how big a turtle tank should be, depends on a number of factors. The first and most important thing to consider is the species of turtle. Some turtle species will remain relatively small while others will grow to be over two feet long. If you prefer a quick answer use the turtle tank size calculator above. Turtles also require a large enough tank for a basking area. The basking area should be large enough for a turtle to move around on without bumping into the walls of the tank. 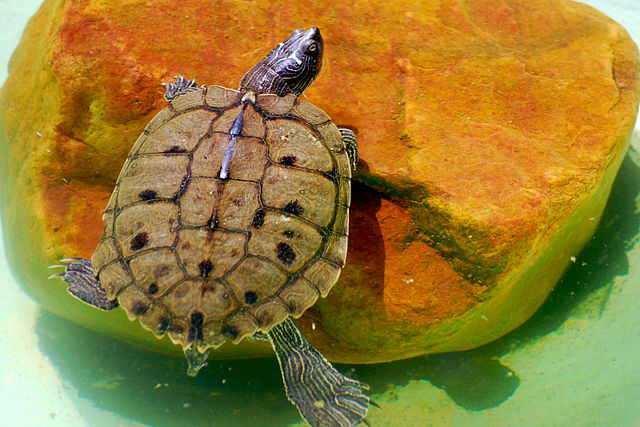 To accommodate a basking platform the water level will have to be low enough that a turtle can stand up and comfortably walk around without hitting the top of their shell. Once you figure out how much space the basking platform needs, then you can consider how much water you need to add. Some turtle species like to swim in deeper water and will prefer living in a taller tank. While other turtle species like shallow water and they will do fine if the water level is just high enough to soak their bodies. 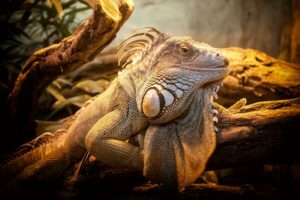 Once you have decided on the species of turtle you plan on keeping in the tank and their cultural requirements, then you can make a more informed decision on what tank to buy. The general rule of thumb when sizing a turtle tank is to provide ten gallons of tank volume for every inch of shell length. 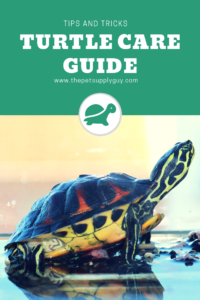 While this ratio is a good starting point, getting a larger tank is always a better option for the long-term health and welfare of your pet turtle. One myth about turtles that commonly comes up is that they won’t grow any larger than their tank. Many people hope this is true so they can get away with getting the smallest tank possible. 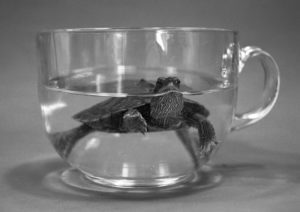 In the long run, though nature will win out, and the turtle will outgrow their tank and then you will have to get a new tank or the turtle will start to suffer. Genetics is the ultimate factor that decides the final adult size of a turtle. As long as a turtle is well fed and properly taken care of you should expect they will eventually grow to reach their genetic potential. For this reason, if you only have enough room for a small turtle, make sure to select a species that stays small even when they are fully mature. If you are looking for a turtle that remains small and is easy to care for then a musk turtle is a great option. 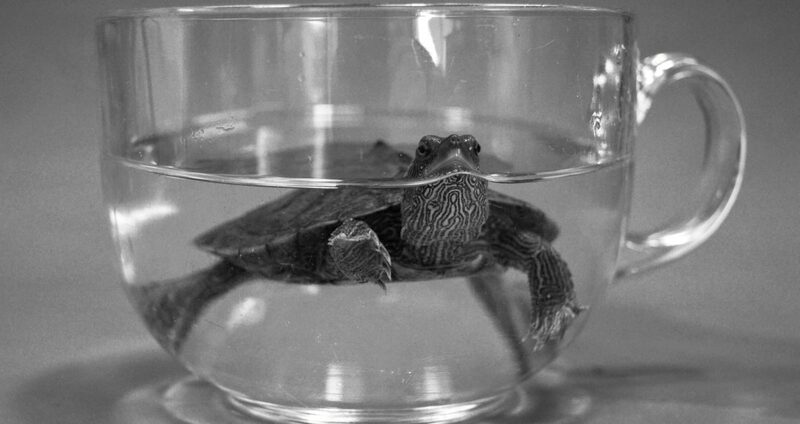 Musk turtles will only reach a maximum adult size of 3 to 4 inches. One thing to keep in mind though is that musk turtles have long lifespans with some specimens living up to 50 years or longer. 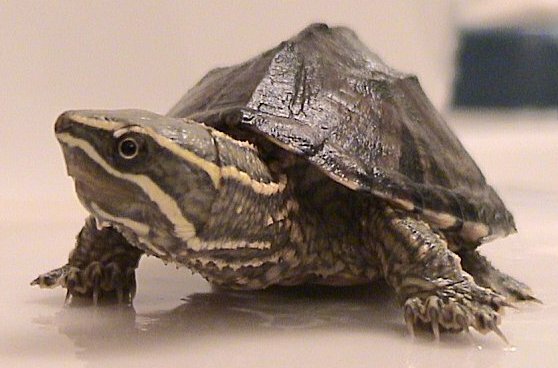 In nature, musk turtles live in ponds or shallow slow-moving streams or rivers. They prefer to spend most of their time in muddy areas in the shallows right at the edge of the water. When they breed they lay their eggs in the sand close to the shoreline. And when they are not active they burrow into the mud for shelter and protection from predators. Painted turtles are a very popular turtle that remains relatively small throughout their lives, and they make excellent pets for beginners and experts alike. The maximum adult size of a painted turtle is 7 to 8 inches. Painted turtles kept in captivity have an average lifespan of about 15 to 25 years when kept in optimal conditions. Painted turtles are found all throughout North America and are one of the few turtle species that can be found in almost every climate. They mostly prefer to live on the margins of streams and rivers and other small bodies of water. Painted turtles also spend a good portion of their day basking. If you plan on keeping a painted turtle they will need a large basking area, so this should be taken into account when you size your tank. When most people think of a pet turtle a red eared slider is most likely what comes to mind. 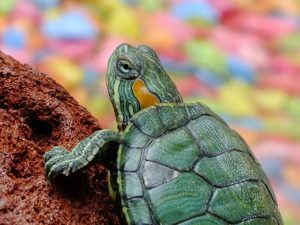 Red-eared sliders are very easy to care for and a readily available in most pet stores. 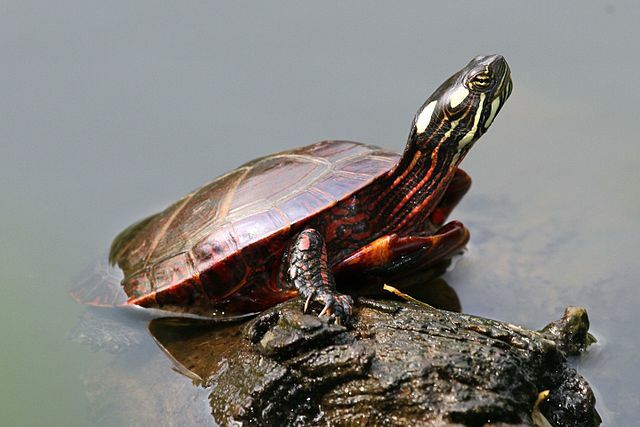 Red-eared sliders range in size from 8 to 10 inches. Female red-eared sliders are larger than the males, so if you plan on keeping only males you can go with a smaller tank. Red-eared sliders are found in the warmer areas of the USA, Mexico, and Brazil. 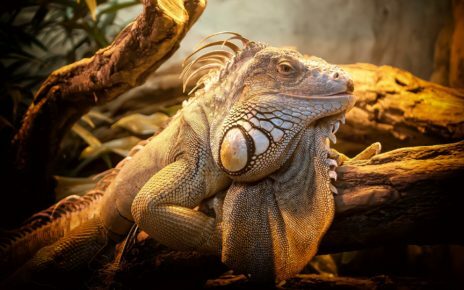 They prefer warm calm waters like ponds, lakes, and marshes. Red-eared sliders spend most of their time in the water and only come out to bask for short duration’s. Because of this, they are not the best climbers, so they will need a basking platform that is easy to pull themselves up on. For the most part, they will do best in a deep tank that has more water for them to swim in and less land area. Box turtles are a terrestrial turtle with a large dome-shaped shell with bright yellow markings. 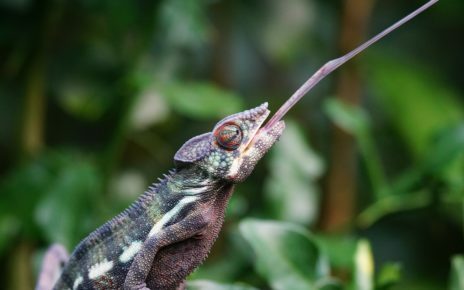 They reach a maximum adult size of 4 to 8 inches when properly fed and cared for. 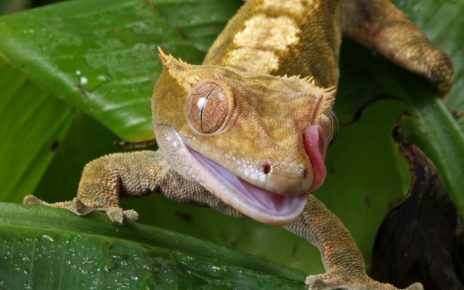 They can live anywhere from 30 to 40 years and there have even been some specimens that have lived for over 100 years. Box turtles are a terrestrial species which means they have a different set of requirements when it comes to the size of their tank. Tank volume is not the key metric when choosing a tank for a box turtle. 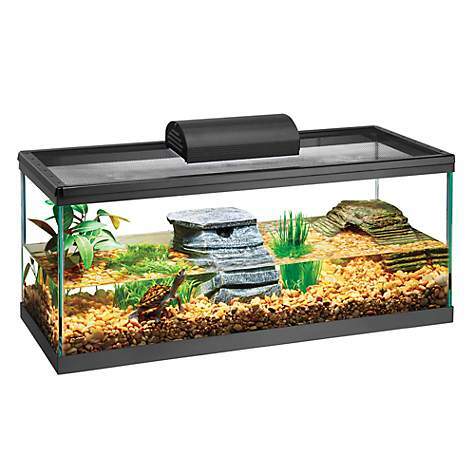 What you should look for in a tank is one with a large surface area at the bottom of the tank. 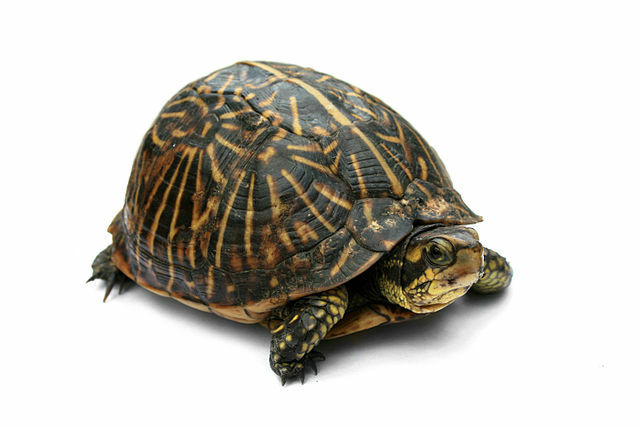 Since a box turtle will spend its whole life on the ground the length and width of the tank is much more important than the volume. Box turtles spend most of their day on dry land and only need to dip their body in water occasionally as long as they are kept in a humid environment. A Box turtle will only need a small pan of water in their tank to soak their body in and as a source of water to re-hydrate. They are also very poor swimmers so the water level of the pan should be low enough that there is no risk of them accidentally drowning. Mud turtles are another turtle that remains small throughout their whole life. Most mud turtles only reach a maximum adult size of 4 to 5 inches, though some species like the Sonoran yellow mud turtle can reach 6 inches when fully grown. Mud turtles are also quite long-lived when properly cared for with some specimens reaching an age of 50 years old in captivity. In nature, mud turtles like to live in ponds with soft sandy bottoms. Mud turtles also do best in clean water that is well oxygenated. For this reason, they need a tank that has very good filtration to stay in peak health. Mud turtles spend most of their time in the water but they still need a basking platform to warm up on and get some UV light. 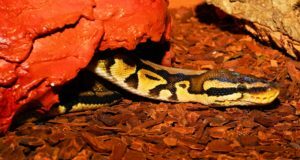 Using sand instead of gravel as a substrate would also be advisable since they like to burrow for safety and comfort. The Mississippi map turtle is a medium to large sized turtle that has a unique appearance. A female Mississippi map turtle will grow to a maximum adult size of 6 to 10 inches. While most male Mississippi map turtles will only reach an adult size of 5 inches. 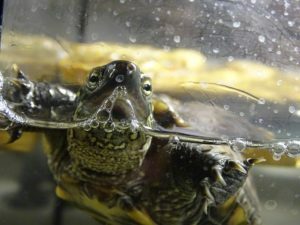 Mississippi map turtles require more care than most other pet turtles, therefore, they are not recommended for beginners. They are very prone to shell rot and bacterial infections, so water quality is of the utmost importance. 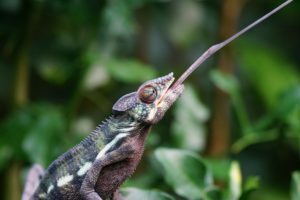 In order to keep their tank clean enough to avoid this, you will need to do frequent water changes and run a strong filter. 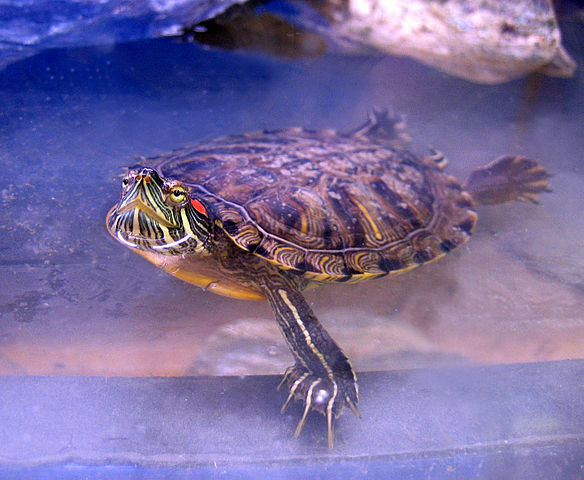 Adding aquatic plants to a map turtles tank might also be a good idea to oxygenate the water and to help remove nitrates.